One of the enigmas of Nepal’s development saga is that despite the absence of local elections for two decades, ten years of violent conflict that left 17,000 dead, wobbly politics and poor governance the country has been cited by the United Nations as a country that has taken the most dramatic strides in health, education and poverty-reduction among developing countries. Most Nepalis have no idea about how much progress we have made in socio-economic development in the past two decades. So, our national past-time is to run our country down every chance we get. What is it about our people, culture and government that in spite of all the glaring shortcomings, including a lack of national self-appreciation, we have achieved so much. And it is tantalising to think how much further ahead we would have been had politics been more stable, our governance cleaner and more efficient. It has been said here before that everything that has worked well in this country in the past three decades has the word ‘community’ attached to it: community forestry that has restored canopy cover over a large part of the midhills, traditional community-run irrigation systems, schools and health posts managed by local communities, rural cooperatives. But one of Nepal’s greatest showcases is the community radio movement that next week marks 20 years since the pioneering Radio Sagarmatha got its broadcasting license. That decision in 1997 firmly established the radio spectrum as being a public domain, putting Nepal far ahead of other countries in the region. As our report on page 14-15 shows, Radio Sagarmatha opened the floodgates for decentralised radio in Nepal with more than 400 FM stations now all over the country. One of the reasons that Nepal did not backslide in development despite a war and 20 years without elected local government was that the vacuum in grassroots democracy was partially filled by radio. It allowed people’s indirect participation in decision-making and compensated for the absence of accountability. Radio also fostered inclusiveness, and engendered progressive values. 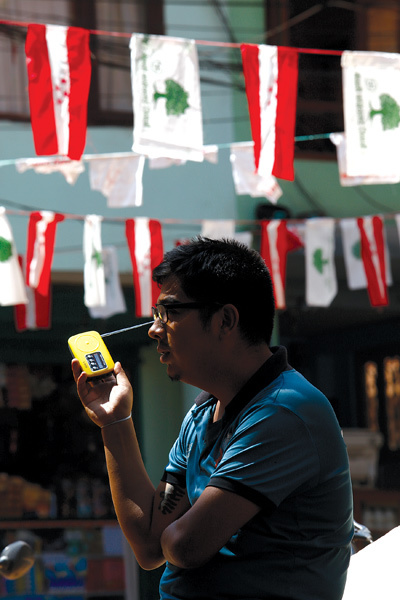 Being locally-run, community FM radio stations helped spread tolerance about Nepal’s ethnic, linguistic and cultural diversity, blunting social discrimination. Perhaps understanding the power of radio, King Gyanendra prohibited FM stations from broadcasting news for six months after his 2005 military coup, only music was allowed. Some stations ridiculed the ban by singing the evening news bulletin. Radio proved to be resilient enough to survive threats from left, right and centre. Bharat Koirala received the Magsaysay Award in 2002 for his contribution to the establishment of community radio in Nepal. As he argues in the Guest Editorial Nepal’s radio revolution seems to have strayed from the original mission, and is now commercialised, syndicates centralised content, and many are owned by local politicians. There is an urgent need to revive the values of public service broadcasting that saw the birth of Radio Sagarmatha 20 years ago so that it continues to buttress grassroots democracy and local development. The forests in Sagarmatha National Park have a new predator. Perhaps its time for Nepal to declare its independence. From Kathmandu.